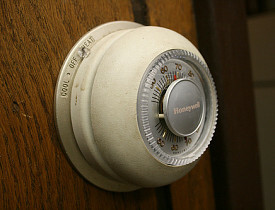 There's no question that lowering your thermostat in winter is a good way to save money on your heating bill. In fact, for most homeowners, it's clearly the best single way to lower heating costs. But it can be taken too far. Setting the thermostat too low or shutting off areas of the home entirely can lead to frozen water pipes, the repair for which can easily eat up several years' worth of savings, not to mention the potentially huge costs of collateral damage from flooding. Here, we'll look at ways to minimize your risk while still keeping the heat at a money-saving levels. The only definitive answer here is, as you might have guessed, 32° F. But no one keeps their house at that temperature, unless they shut off the heat completely before leaving on vacation. In reality, the problem is that the thermostat responds to the air temperature in its immediate vicinity, typically smack in the middle of your living space. Even if the home's main hallway or family room is in the 60s, the temperature inside exterior walls or within kitchen or bathroom cabinets—places where pipes often reside—can be much colder. You might reason that it's safe to drop your thermostat to 50°, for example, because that's still 28° above freezing, but it all depends on where your pipes are. Knowing where your water supply pipes run not only can prevent you from driving a nail into a hidden pipe, it can also reveal areas where pipes are most vulnerable to freezing. As a general rule, water supply pipes should not be routed through exterior walls, where there's relatively little protection against outdoor cold. But this happens all the time. To locate your home's water pipes, start at the water heater, and follow both cold- and hot-water supply lines (typically copper or galvanized steel pipes) to each fixture. Most of the pipes will start across the floor above the basement or crawlspace and then go up into interior walls. Where plumbing fixtures are placed next to exterior walls, like a kitchen sink under a window, pipes still should approach from the interior as much as possible. Make a note of any areas where pipes pass through exterior walls over extended runs. (It's OK if pipes penetrate concrete or block foundation walls below ground level, because here the walls remain close to the earth's constant temperature of 55°.) Also note where exposed pipes are concealed by cabinets, especially along exterior walls. Now that you know where your pipes are, be mindful of the temperatures in rooms or areas where pipes are vulnerable to cold. If you want to be scientific about it, use a thermometer to check the temperature at specific sites (near pipes) with different thermostat settings. The best type to use is an indoor/outdoor digital thermometer with min/max recall, which records the lowest and highest temperatures in a 24-hour period. With a little experimentation, you can roughly determine the lowest household temperature that's still safe for your pipes. Just don't forget to factor in any unusually cold weather.